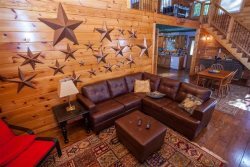 About the Owners of Wilderness View Cabins, The Overlook Inn, and Ellijay Cabin Rentals! Ever since childhood summers in the Catskill Mountains of New York, I loved spending time in the mountains. I instilled this in my son Louis by spending weekends in the mountains of West Virginia as he grew up in the Washington DC metropolitan area. This love has now brought us to the beautiful mountains of northern Georgia. After over 25 years as a Project Manager in the Biotech and Pharmaceutical Industry (and the traffic of the Washington DC metropolitan area), I have decided to bring my organization and customer service skills to the hospitality industry. Louis is an IT professional; his expertise is invaluable in maintaining our reservation system, updating and designing our website and communicating on social media. Louis also has experience with home maintenance and repairs including plumbing and wiring. Liz and Robert Coleman built and grew a wonderful business with ethics that we respected. My son and I are honored to now take Wilderness View Cabins and Ellijay Cabin Rentals to the next level. We will maintain the quality and luxury of the cabins and continue with their special brand of personalized customer service.